The New York Times published an article titled “Why Women Apologize and Should Stop” that deserve some serious applause. It is true for many women, myself included, “I am sorry” is over-used to show our politeness and is labeled ourselves as weak unnecessarily. According to this study, “women have a lower threshold for what constitutes offensive behavior,” therefore apologize more for the same social situations in which men do not apologize. To me there is also another reason of why women feeling the need of apologize, even when we are demanding things we deserve – like a raise. We are not confident with ourselves and simply do not think we deserve what we have got, or should have gotten. That is why the society can get away with unequal pay and poor maternity care for so long in such a well-developed economy. Stop apologizing does not mean we have to behavior rudely. Simply state what we want to say and realize that this is what others need to hear. Only when we stop treating ourselves like the second class, we could stop be treated like the second class. Scientists make discovery everyday. They are usually tiny discoveries, some important, some not. We never do things we already know. We always, always try to figure out something no one understands. In such way, we slowly, brick by brick, sand by sand, build the knowledge we have today. Even sometimes we think we have known enough about one topic, with ever-improving technologies, scientists can discover a whole new layer of knowledge that we did not even thought exist, like a whole new universe, then “the Universe” becomes “an universe”. This month, such discovery has made and completely changed how I see brains. This paper published on Nature, discovered a whole set of vessels lining inside the surface of our skulls that carries the fluid and immune cells from lymph nodes into our brain. This is the first time we can see with our eyes the physical connection between our immune system and our central nervous system. Previously, it was thought that our brains were surrounded by a barrier of cells and therefore were protected from immune responses (as shown in left) We have to endure immune responses everyday because of infections and diseases. It is comforting to think that our brain remains disease-free and clear. Also, because we believed that the brain was an isolated unit and getting little influences from the rest of the body,it was thought that any diseases in our brains must be due to the dysfunction of brains themselves. This discovery for the first time, provided a physical evidence that the immune cells in our peripheral system, can enter and exit our brains a lot easier than we previously thought. During infections, chronic diseases and stress, when our immune system is activated, immune cells can travel into the brain and induce reaction there. This suggested that lots of neural diseases we see today, might be linked to immune responses. This is the most significant discovery in medical sciences I have seen for a while. I often hear postdocs and graduate students around me complaining that all the “major discovery” or “low-hanging fruit” are all taken year ago and it is hard to make new progress that are nearly significant. I think this is BS. There are so much we do not know. What it takes, is to get out of our comfort zone, everyone’s comfort zone and think out of the box. It is interesting how science can be done in seem-to-be completely opposite ways – What we do everyday, is to make an hypothesis and design/perform the best experiment to test it. Hypothesis has to be a reasonable guess based on what we HAVE ALREADY known. So, what about the things we do not know? What if what we have know is not accurate or incomplete? The other way of science should be to discover, to look for something we do not know exist but might. I am tired of hearing people shooting down other people’s ideas just because something is “not well supported’ because of the LACK of knowledge. 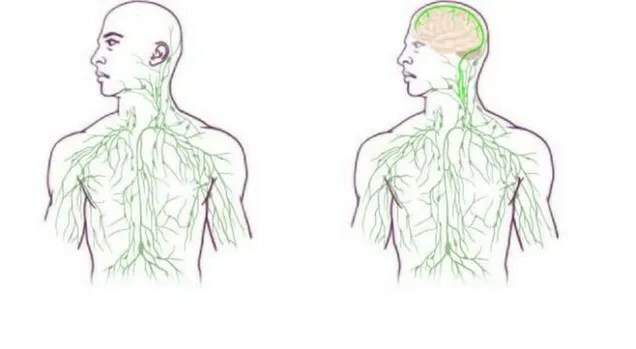 If the authors of this paper believed the long-held concept in the textbooks, the complete absence of lymphatic vessels in the central nervous system, they would never have tried to look for these vessels at all. Working among scientists, I believe most of us are curious and can think out of the box. But we are no longer encouraged to do so for a very practical reason – funding. As funding sources are drying up, money encouraging new discoveries are getting tighter and tighter. Proposing a project to look for something that people believe absent, even no one really looked, is suicidal. Working in science for 15 years since college, my colleagues are slowly dropping out for more practical jobs. “what am I in for?” Frankly, I ask myself this question sometimes too. There is no money, there is a lot of worry and stress. There comes a huge responsibility, to the society, to every taxpayer who works hard everyday and supports expensive research projects, to people who are sick, and will be sick and need our help. What keeps us going, is the power of knowing something everyday, which no one knows; It is the believe that what we do one day could potentially help someone to have a better life; It is the excitement I experienced reading this very article, and feeling so proud for these authors who have sit next to their benches day after day to make such a significant progress. For them, for us, it is the moment to celebrate. 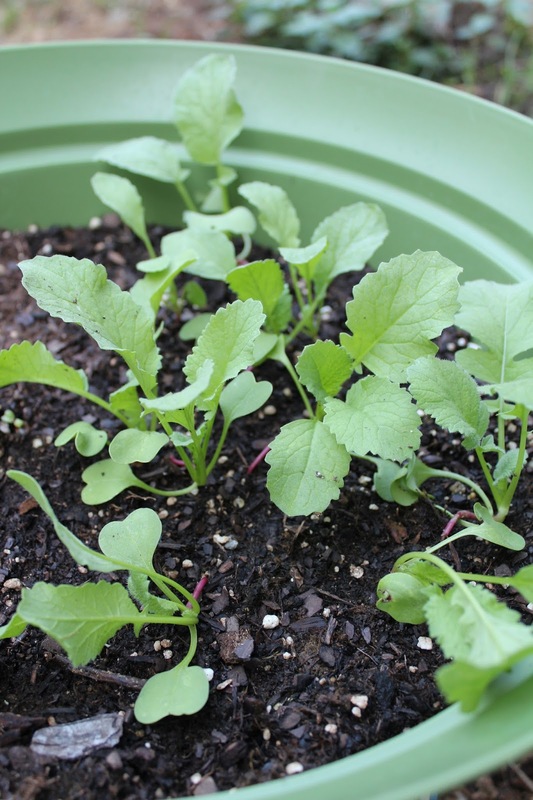 Apartment Therapy recently published an article called “How to grow radishes“. It says that radish is the “easiest thing to grow”, which I heard from multiple resources. 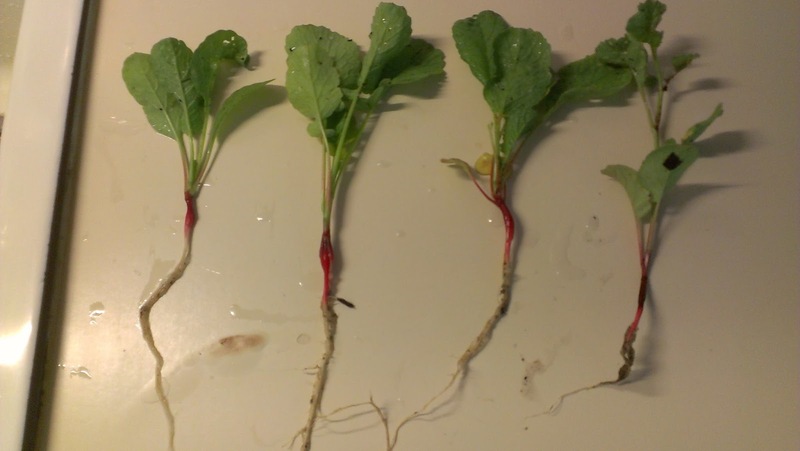 It seems like growing radishes is simply putting the seed in loose soil and water them frequently. But guess what, this is the first year for me to grow them and I have failed twice – TWICE! I seeded my first batch indoors when it was still cold outside. 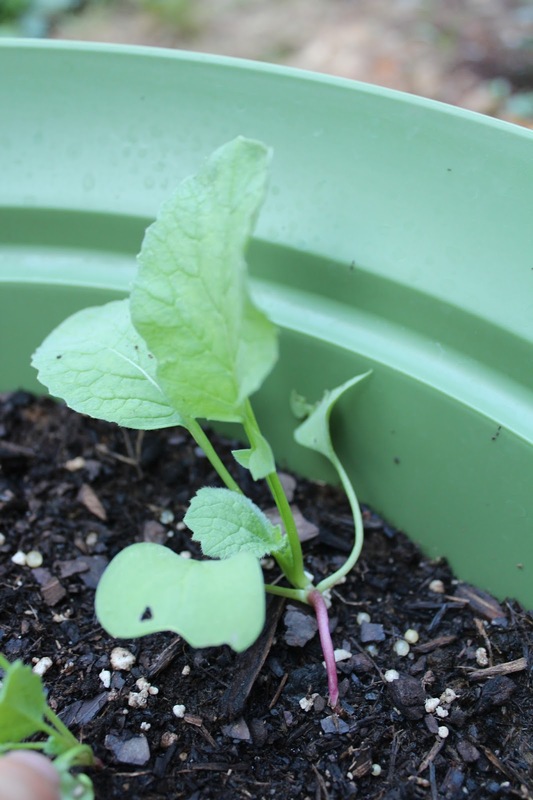 I read everywhere that radishes are OK to be planted directly outside in cold weather, since it is a cold weather plant. But I thought hey, why not give it a better chance? Unfortunately, our apartment is facing north and does not get enough sunlight. So almost all of my seedlings did not make it, including radishes. And when I read more gardening tips, it turned out cold weather plants do not just tolerate cold temperature, they simply LIKE cold temperature, So I overprotected them unnecessarily and actually missed the perfect season for my radishes. A rookie mistake! My sister called them pre-mature$^%$@_@. Sigh. I expect the red portion of root to expand any day now. I plant to leave them until 6 weeks old, and start pulling them out one at a time to check on the growth. Hopefully this batch will make its way to my dinner table and become this roasted radish, or this radish salad, or who knows, the star of one of these amazing recipes!